Back Yard Kitchen is located in the Marina, far outside my normal stomping ground. But, I was in the area doing some shopping, so I of course pulled up LevelUp to see what was around. Cookies, with great reviews, that came in under budget given the initial LevelUp seed money for the venue, so I could try them free ... sold! The cookies are individually wrapped, in a cookie jar. Once I ordered one, I was instructed to get my own out of the jar. It was explained that was part of the fun, reaching into the cookie jar. I thought this was a really fun quirk. I went back several times, and enjoyed this little ritual each time. On every occasion, the staff were really friendly, and unlike pretty much everywhere else I've been, LevelUp worked fine, no complaints. If I'm in the area and want a cookie, I always stop in. I've gone back several times since I first wrote this up, to try more cookies. I've been very impressed with them. It turns out that they make a big batch of dough, and bake the cookies daily until the dough runs out, and then change types. This is exciting, as it means they are changing the variety of cookies about once a week. So many more to try! I also found out that their pastry chef does the pastries for Per Diem, which I've wanted to try for a while now, and this gives me even more motivation to visit. Update: On my last visit, I found out that the chef who made the cookies was no longer working there. And didn't really like the cookie I had that final day. Sadness. I'll still go back to see if it was a fluke or not, but I really am saddened by this news, as I loved the cookies so much before! I will have to track her down at her newest endeavors, as the brown butter chocolate chip cookie was so, so good! Brown Butter Chocolate Chip Cookie. $1.50. This was a very tasty cookie! It was incredibly soft, just barely cooked past gooey, which I loved. It had an intense brown butter taste. 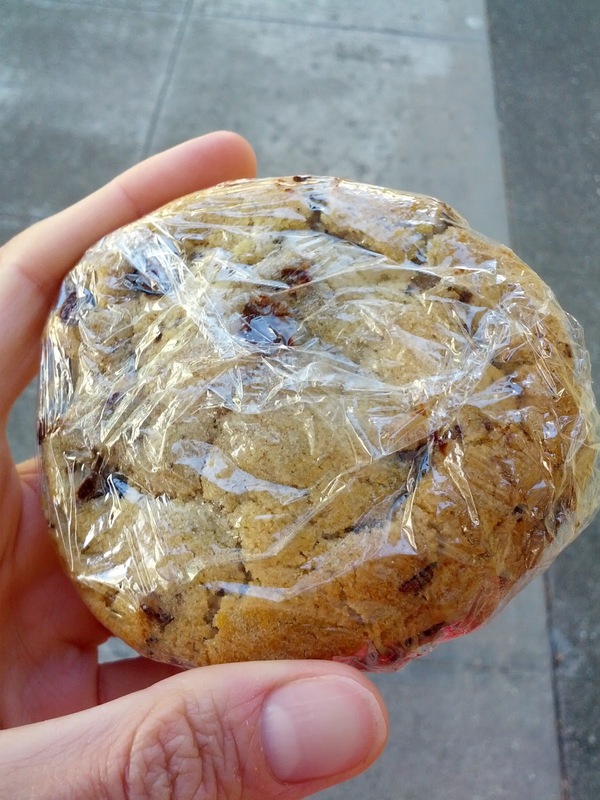 The chocolate chips were standard, but there was a good ratio of chocolate to cookie, not overwhelming. 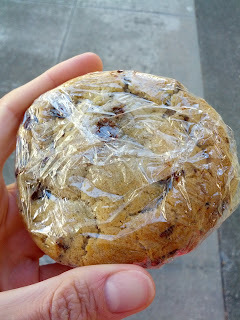 Overall, one of the best chocolate chip cookies I've had, and I'd gladly get another. It was a perfect size - bigger than you'd ever make for yourself, but once you start eating it, you are glad it is that large, but it also was not so monstrous that you feel THAT guilty for it. Great size for the price too. Would gladly get another if I could! Spiced Praline Pecan Cookie. $1.50. 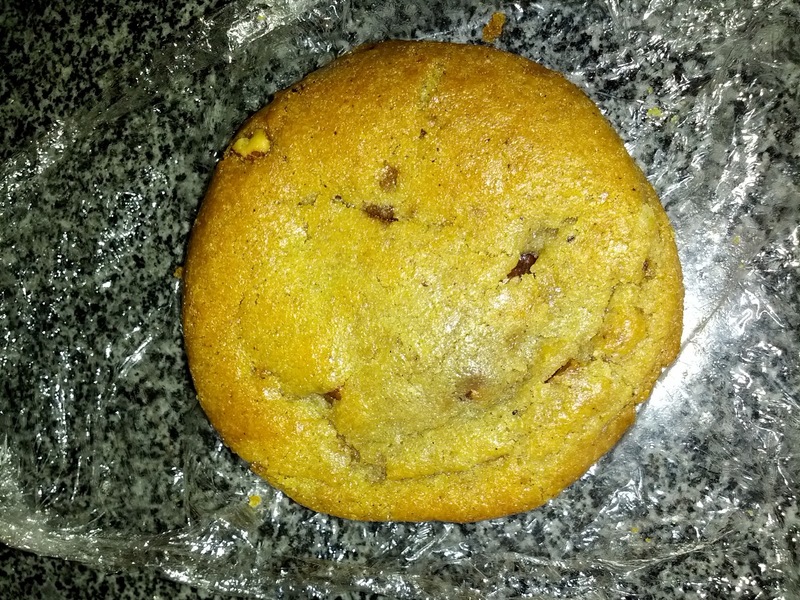 Just like the brown butter chocolate chip cookie, this was nice and soft, almost gooey. Just perfect. The size was also the same, slightly bigger then you'd make, but not ridiculous. The flavor was very buttery and intense, and had some slight spicing to it. There were a few whole pecan halves distributed throughout. Overall, this was good, but the brown butter chocolate chip was better. Pumpkin Spice Chocolate Chip Cookie. $1.50. This one was a very different style than the previous cookies. Smaller in diameter, but much thicker. It had subtle pumpkin flavor and spicing, and tons of tiny chocolate chips. 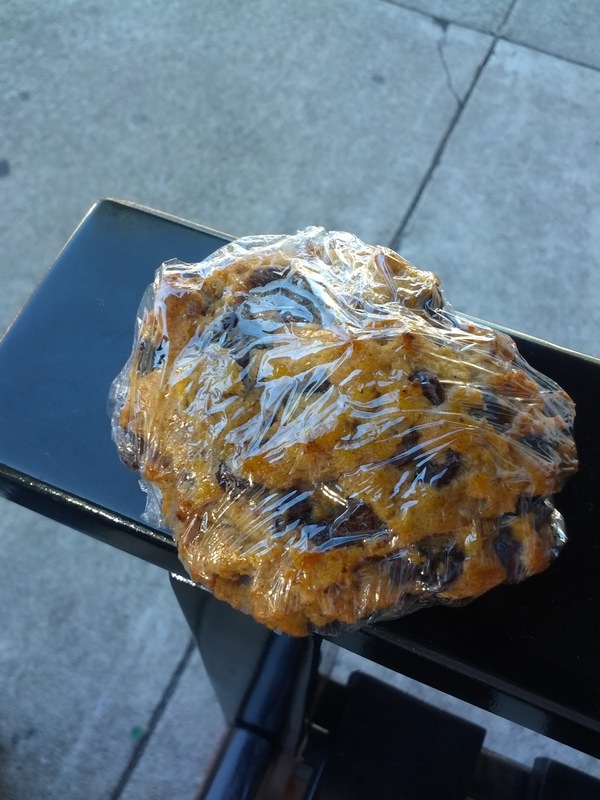 It reminded me more of a pumpkin bread or muffin than a cookie, as it was so cakey. Not really my type of cookie, but it also seemed like something I could almost justify eating for breakfast ... mmm, breakfast cookies! 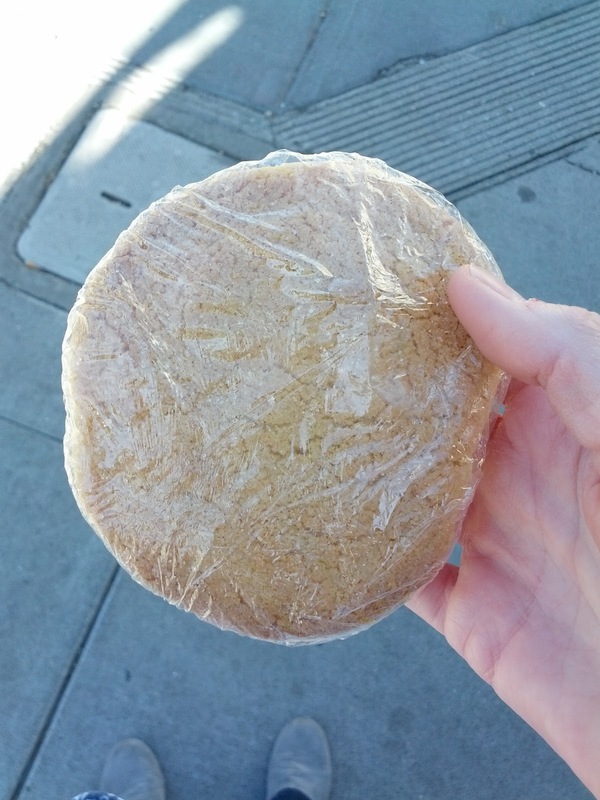 You've probably heard me talk about Snickerdoodles before. Perhaps my least favorite type of cookie. They always just fall short for me. But Back Yard Kitchen only has one type of cookie per day, and I was there, so I decided to try it out. This was also the first one I had from the new baker. It was really crispy. The style of cookie I just don't like. I like gooey cookies! It had some sugar and cinnamon flavor, but meh, really not my thing. A little burnt around the edges. My least favorite by far. Pinkberry (yes, the froyo shop, which I've reviewed before), just introduced a new section to their menu: Greek yogurt. Not Greek frozen yogurt, but regular Greek yogurt. Just like their frozen yogurt, you can choose from a plethora of toppings, creating your own combinations, or use one of their "signature recipes". Along with the Greek yogurt, they added new savory toppings: cucumbers, tomatoes, basil, sunflower seed bites, balsamic glaze, chili powder, sea salt, and olive oil, and a few sweet syrups: strawberry puree, cinnamon honey, and vanilla agave nectar. You can also still pick any of their original toppings. Strawberry Mango: Strawberries, mango, coconut, toasted almond slices, strawberry puree. Chocolate Berry: Blueberry, raspberry, dark chocolate granola, chocolate shavings, cinnamon honey. Kiwi Strawberry: Kiwi, strawberries, mango, honey almond granola, vanilla agave nectar. Sunflower Cucumber: Cucumber, sunflower seed bites, olive oil, chili powder. Tomato Basil: Grape tomatoes, fresh basil, olive oil, balsamic glaze, sea salt. The yogurt itself is very much a gateway Greek yogurt. I think it will satisfy those not used to Greek yogurt, as it isn't too tart. But it also isn't nearly as sweet as most yogurt, with no added sugar. The sweetness is totally dependent on the mix-ins you choose. The yogurt is very smooth and creamy, a bit hard to believe it is non-fat. Far creamier than I usually associate with a non-fat yogurt, but I'd still prefer full fat. I wasn't blown away by any of the creations I had, but it is clearly far better than any packaged yogurt with mix-ins or fruit on the bottom. And if I was at Pinkberry, um, hello, I'd get the froyo! That said, I think they are definitely onto something here, as people love to customize and build things, and while froyo is awesome, this would be appropriate for breakfast, or for the more health conscious out there. The first time I visited, I was overwhelmed. Should I get a "signature recipe"? Or make my own? 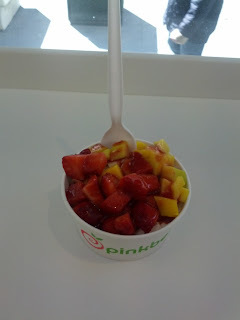 I had no idea what would be good on regular Greek yogurt, since the toppings I normally pick at Pinkberry are much more appropriate for dessert. I decided to go for one of their selections, assuming they had recipe tested and found winners. The savory ones still sounded crazy to me, so I wanted a sweet one. And mangos jumped out at me. Strawberry Mango it was. Once I ordered, the server just pulled out a container of pre-scooped yogurt. She pulled off the lid, and threw on a heap of coconut, then almonds, and then the two fruit selections. She finished by drizzling the strawberry puree all over it. The yogurt was creamy and a bit tart. Not really better nor worse than any other Greek yogurt I've tried over the years. The strawberries were not particularly flavorful, but they were at least fairly ripe. And strawberry season did just begin. The mango was not bad, but was not totally ripe. It is hard to get good mango in the US anyway. The strawberry puree was sweet, with some strawberry flavor. It easily blended in, like one of those fruit-on-the-bottom type yogurts. The fruit elements, although not great, all worked with the yogurt. But I really did not like the coconut nor almond slices. The texture of coconut and slivered almonds was just strange with yogurt. And the flavors didn't really work either. The coconut was just standard shredded coconut, not the more flavorful toasted version. The almond slivers were as generic as can be. I wouldn't ever get either of those on yogurt again. Overall, it was an ok combination of things, but I did find myself wishing there was granola. It occurred to me that I've never had a Greek yogurt parfait without granola. I certainly wouldn't get this recipe again, but I'm not quite sure what I'd want instead. Good Morning America Special: Blueberry Almond. As part of a promotion with Good Morning America, Pinkberry created another signature recipe, offered for free for two days: the Blueberry Almond. It was yogurt, topped with honey almond granola, toasted almonds, fresh blueberries, and drizzled with cinnamon honey. Since I didn't care for the slivered almonds last time, I asked to have them left out. The staff member let me know that there were small amounts of almond in the granola, and offered to switch it out for the other type of granola they offered. Since I don't actually dislike almonds, just the slivered ones in my yogurt, I opted to keep it as close to the recipe was possible. The yogurt this time was scooped and weighed out when I ordered, rather than pre-scooped as in my first visit. I'm guessing they may have just had them scooped out in advance that day since it was the first big freebie day they were doing. The yogurt was again creamy, not super sweet nor tart, pretty generic yogurt. It is clearly designed to be customized with toppings. The blueberries, like all other Pinkberry fruit I've had, were good enough. Not amazing, but fresh and ripe. The granola was fairly disappointing - it was basically just oats. I didn't find any almond in it, and there were not really any clusters. It added a nice crunch, and I appreciated it for the textural variation, but as a granola, it wasn't great. The cinnamon honey was the big selling point. Very thick honey, obviously sweet, and loaded with cinnamon flavor. It went so well with the yogurt. Overall, I enjoyed this mix much more than my previous one. I'd still like to try out other combinations, but this one worked. Create Your Own: Cinnamon Honey, Chocolate Granola, Caramelized Almonds, Kiwi, Mango, Mochi. On my third trip, I decided to get adventurous and try the "Create Your Own" option. I was instructed to pick one syrup, two crunchy toppings, and three fruits. Since I loved the cinnamon honey so much last time, I quickly picked that one. She asked if I'd like it on top, or on the side, so I got it on the side, so I could mix it in as I wished. For crunchy toppings, I was a bit stumped. I didn't like the coconut or the almonds the first time, and the honey almond granola was pretty boring. Most of the other crunchy toppings didn't seem quite right to put on yogurt ... chocolate pretzels? Gummy bears? Brownie bites? Delicious, but they would be weird. So I went for the other type of granola - chocolate. It didn't have much chocolate flavor, and like the honey almond granola, wasn't really great, just good for some crunch. I also picked caramelized almonds, trying to improve upon the slivered almonds. They were pretty good, much crunchier than the granola, a bit sweet. Not what I think of mixing into my Greek yogurt, but it worked. The kiwi wasn't very ripe, and wasn't good. I wouldn't try it again. The mango was better this time, riper, sweeter. For my third "fruit" topping, I picked the mochi, mostly because the other fruit just didn't look that good, and I love mochi. I knew it was strange to put on yogurt, but whateves. I just ate it first. It was soft, sweet, rice-y. 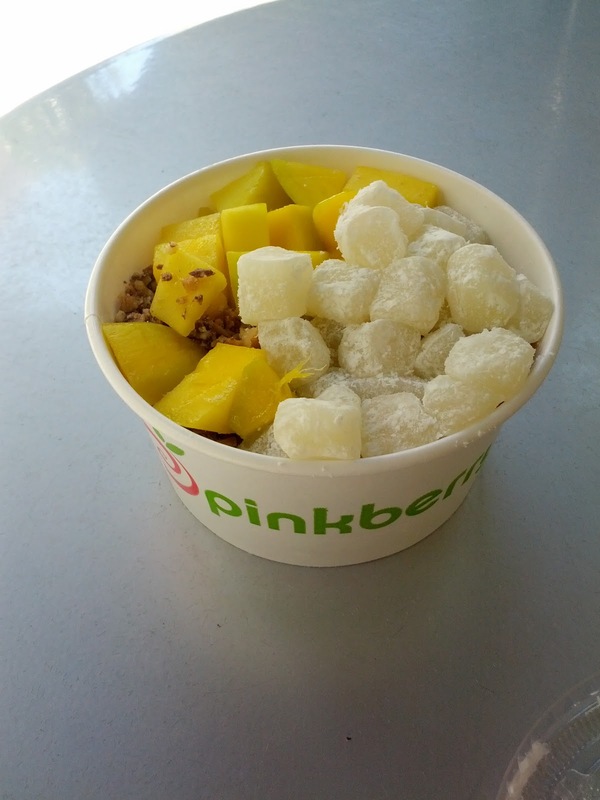 Create Your Own: Almond Roca, Mango, Mochi. Finally, I was ready to create my ultimate creation. Or so I thought. On my fourth visit, I wanted the mango and mochi combination again since I enjoyed it so much last time. Glancing into the case, the mango didn't look ripe. A lot of it was green. But I still gave it a shot. Instead of adding a third fruit, since I haven't been really impressed with any of their fruit, I asked for just lots of mochi. Like last time, the mochi was soft and delicious. Totally not a good topping for Greek yogurt though. But the mango, like I feared, was hard, tart, not ripe. Their fruit is really so inconsistent. 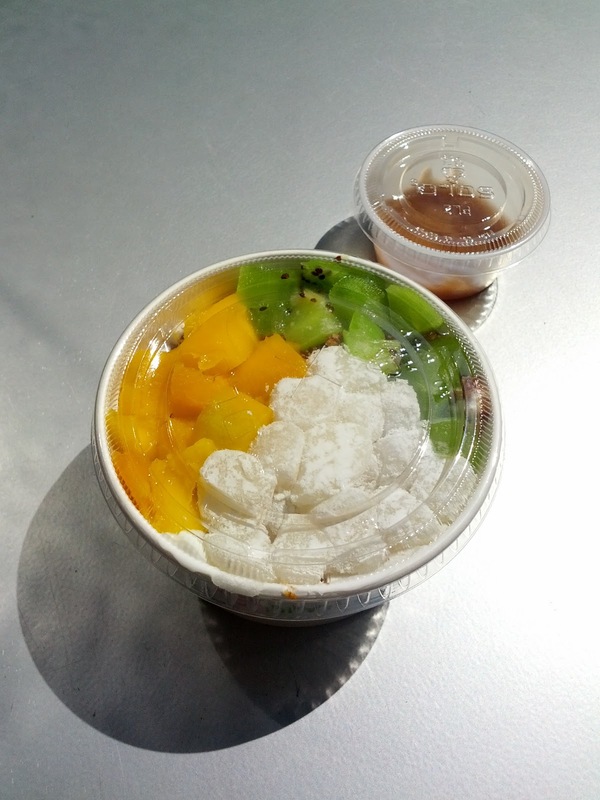 The mango and mochi went well together, and the mango and yogurt went well together, but it was not good. If the mango looks ripe, I recommend it, but otherwise, skip! For dry, crunchy toppings, I was at a loss. I didn't like the standard yogurt toppings of granola, coconut, almonds before. The candy really didn't make sense, nor did chocolate balls. I was allotted two choices, but decided to just pick one, since none were jumping out at me. What did jump out ... almond roca. Another topping that totally doesn't belong on Greek yogurt, but is delicious. It did give a nice crunch inside the yogurt, and chocolate can kinda work, but ... no. After trying a few bites with the almond roca and yogurt, I quickly realized the error of my ways, scraped it to the side, and enjoyed it as my "dessert" after I finished the rest of the yogurt.